The Playford Heritage Park is an ambitious plan by Leigh Creek residents who want to see the Far North town prosper in a life after coal. Project organiser, Friends of the Flinders Communities, hopes the project will become an oasis in the desert “fostering fresh ecologically sound developments to help ensure a bright future for the Northern Flinders Communities”. 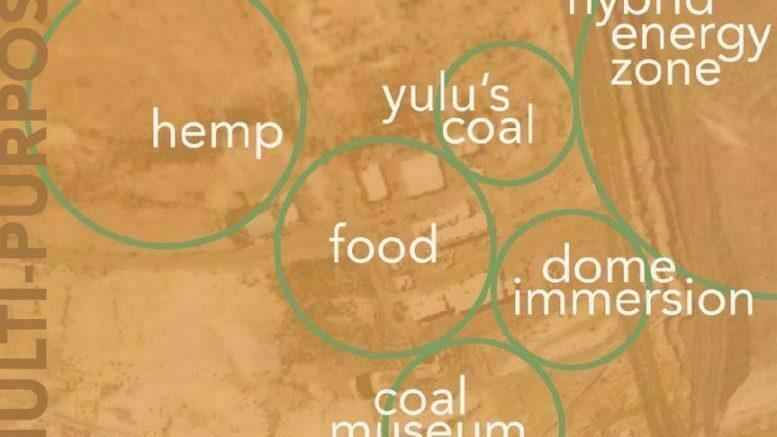 The proposal is budgeted at between $8 and $12 million and involves a Leigh Creek Coal Museum, Heritage Park, Industrial Hemp production and a Hybrid Energy Zone. The proposed site also features an immersive dome experience enabling visitors to safely tour the Leigh Creek Coal Fields from the comfort of a cinema chair. It also proposes an indigenous cultural studeis centre near the Yulu’s Coal damper and firestick, both of which are Adnyamathanha cultural items. The first stage is the establishment of a not for profit (NFP) structure which will enable a professional fundraising approach aimed at establishing a business estimated to create between 50 to 100 full and part time jobs for the region. The park is a proposal before the South Australian state government to creatively repurpose the assets at the Leigh Creek Coalfields into an innovative Heritage Park with multiple local and state social, cultural and economic benefits. The project has progressed recently and now requires cooperation between several government departments including State Development, DPTI , Education and Child Development. Accessing support now via the Leigh Creek Futures a state government funding program, is key to further development of the business plan and fund raising. Asked about the development of Hemp proposal Mr Carney said SAWater and Melbourne-based business firm Kovess International have provided timely assistance and interest in what is a ‘key business stream’ in relation to site remediation and revenue creation. “Costings are underway for the dredging of the dam which would be an enormous bonus for the hemp production and the restoration of the largest water catchment in the outback of SA. Mr Carney said he’s received positive feedback from Flinders Power who are assisting with the project by providing helpful information.